How to turn a passion into an occupation. Champion shooter Rob Leatham translated his skills into a full-time job shooting for and representing Springfield Armory. 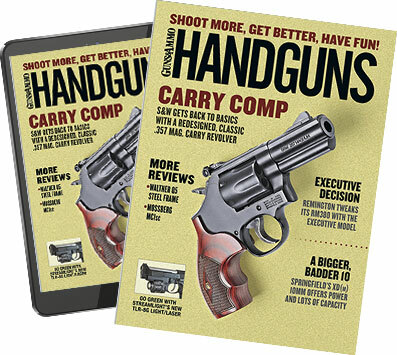 It's no surprise to rob leatham that he loves shooting handguns. He was born into a family of "professional plinkers," says this native of Mesa, Arizona, and they spent their free time reloading and shooting. So the young Leatham became a reloader, shot every chance he got and entered his first handgun competition at the ripe old age of 17. More surprising for Leatham is that his passion for shooting became his day job. Probably the best known competitor on the action shooting circuit, Leatham, 50, is a 24-time U.S. Practical Shooting Association national champion. In 1989--as his wins were multiplying and action shooting was gaining in popularity--Springfield Armory signed him to a full-time contract, with benefits. His job, then and now? "It really hasn't changed a lot over the last 20-plus years," says Leatham. "To go shooting. How good is that?" Actually, there's a little more to it all--for Leatham and other pro shooters. Yet, the bulk of his job with Springfield really is to shoot handguns competitively, to win matches frequently, and in the process promote the Springfield Armory line of handguns. There's a relatively small cadre of people who, like Leatham, shoot for a living. But it's growing. Today, nearly every large handgun and ammunition manufacturer--and numerous accessory makers--sponsors at least several individual shooters. Remuneration varies from actual paychecks and benefits packages to providing equipment and some expenses. Team Smith & Wesson, for example, currently has 20 members. Only three of these slots are held by "Team Champions," meaning they are paid positions. Champions enter a good number of shooting competitions annually, represent the company at trade shows, help with product testing and are available for media interviews. The other 17 team members? "They're really good shooters," says team captain Julie Golob, "well-versed in the product line." They represent Smith & Wesson at regional and national competitions. Support comes in the way of handguns, equipment and some expense monies. "It's not their day job, essentially," notes Golob, 33, who came to Smith & Wesson after eight years with the U.S. Army Marksmanship Unit. She's also won 80-plus titles in regional, national and international handgun competitions. For the last three years, Team Smith & Wesson has run an open selection process, with an on-line application and interviews for top applicants. Obviously, good shooting skills rank very high, and competitive wins "help a lot" in being recruited, says Golob. At ammunition maker Hornady, Neal Emery oversees the 20-plus members of Team Hornady Pro Staff, which includes the likes of top handgun competitors Doug Koenig and Max Michel. "Typically, our pro staffer is someone who either wins consistently or is in the top percentile," says Emery. In the past, word of mouth within the shooting industry brought in most team members. Now, though, Hornady is implementing a more formalized process to better evaluate credentials and qualifications. Beyond top marksmanship skill, today's pro team shooters also need people skills. "We find that the Team Smith & Wesson blue shirt attracts a lot of people," says Golob. "So our team members have to be very approachable," especially at competitions where onlookers like to chat up team members for shooting and product advice. "I've seen people come in to this who just can't talk to other people," says Leatham. "That's difficult. What a company is looking for is promotion. Winning is good for promotion. But you have to be able to connect with people, too." Pro shooters often do in-store promotions. They may man a company booth at an outdoor show or give a shooting workshop. Familiarity with their sponsor company's entire product line, and the ability to share that information with the public, is a must. It doesn't end there. At Hornady, for example, "Social media's going to a big thing we're getting into more and more," notes Emery. "We're expecting our shooters will have a big presence on Facebook and other such venues." Leatham's advice to a budding handgun shooter with pro team aspirations? "You have to want to shoot so bad, you'll do it on your own, develop your skills and push yourself, without expecting to get anything out of it," he says. "If you do that, you just might make it."